Announcing its new product line of super lightweight and compact e-readers, PocketBook presents the easy-to-use PocketBook 616 equipped with E Ink Carta™ screen of HD resolution and frontlight. With the new PocketBook 616 the reading “on the go” breaks new ground. Implemented in the new minimalistic and refined design, the compact device with dimensions of only 161.3 × 108 × 8 mm suits a standard jeans pocket and even the tiniest ladies’ handbag. 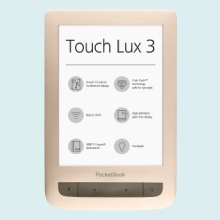 The PocketBook 616 is equipped with an E Ink Carta™ screen with HD resolution (758 × 1024), which ensures safety and comfort for the eye even after hours of non-stop reading. The LED frontlight invites to enjoy fascinating e-books even in a place with low-light conditions. The new PocketBook 616 embodies lightness and simplicity in all senses. It received ergonomic paging buttons for facilely controlling. The weight of only 155 g makes the e-reader one of the lightest on the market. With the intuitive user interface, the changing of settings and managing the library is easy and fast. 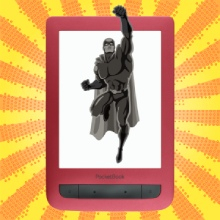 The e-reader may always be at hand, offering to choose one of up to 3000 e-books from the user’s personal library. The PocketBook Basic 616 has 8 GB of internal memory and a slot for microSD cards, which allows expanding the memory by up to 32 GB. Read in a moment with PocketBook 616.